Almost everyone snores occasionally, but if snoring is frequent, it can lead to poor sleep, fatigue, irritability and increased health problems. Hence, it is important to find a right solution to eliminate snoring. Here are a few things you can do to eliminate snoring. • Lose some weight- Losing even a little weight will help you reduce fatty tissue from your throat and decrease or even stop snoring. • Exercise regularly- Regular workouts will not only tone your arms, legs and abs but also tone your throat muscle, which will in turn reduce snoring. • Stop smoking- Smoking aggravates snoring by blocking your throat muscles and airways. • Avoid alcohol and sedatives- Alcohol and sedatives are seen to relax your throat muscles and interfere with breathing causing snoring. • Develop regular sleep patterns- Create a regular sleep pattern and stick to it as it will help you sleep better and minimize snoring. Keep a good sleep posture- Avoid sleeping flat on your back as it worsens snoring. You can try the "Tennis Ball Trick". Attach a tennis ball to the back of your T-shirt or pajama while sleeping. The tennis ball will make sleeping on the back uncomfortable and you will end up sleeping on the side. 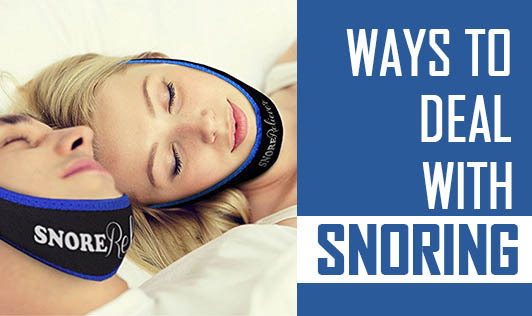 Try these easy solutions for a snore free and sound sleep!